Edited by Faheem Judah-EL D.D. 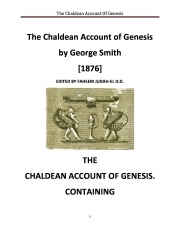 Description of "THE CHALDEAN ACCOUNT OF GENESIS (eBook)"
George Smith - In 1872, Smith achieved worldwide fame by his translation of the Chaldaean account of the Great Flood, which he read before the Society of Biblical Archaeology on December 3 and whose audience included the Prime Minister William Ewart Gladstone. This work is better known today as the eleventh tablet of the Epic of Gilgamesh, the oldest known work of literature in the world. The following January, Edwin Arnold, the editor of The Daily Telegraph, arranged for Smith to go to Nineveh at the expense of that newspaper, and carry out excavations with a view to finding the missing fragments of the Flood story. This journey resulted not only in the discovery of some missing tablets, but also of fragments that recorded the succession and duration of the Babylonian dynasties. In November 1873, Smith again left England for Nineveh, for a second expedition, this time at the expense of the Museum, and continued his excavations at the tell of Kouyunjik (Nineveh). An account of his work is given in Assyrian Discoveries, published early in 1875. The rest of the year was spent in fixing together and translating the fragments relating to the creation, the results of which were published in The Chaldaean Account of Genesis (1880, co-written with Archibald Sayce). Reviews of "THE CHALDEAN ACCOUNT OF GENESIS (eBook)"